When we started our business in 1989, we didn't magically decide that the rules below were going to be our guiding principles. We just did what we thought was right. 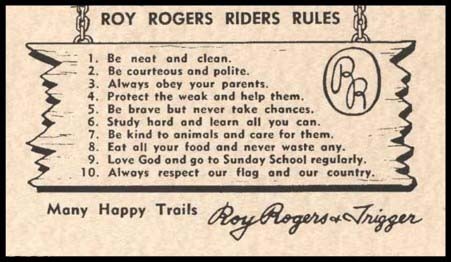 However, after reading the picture on our kid's wall year after year, we laugh that the same principles Roy Rogers penned decades ago line up with ours. The simple codes of the west still seem to mold how we try to live and do business today. Take a tour around our business and you might even stumble upon a few of these displayed in different offices. If you catch us veering off this trail, don't be afraid to point it out.